Comet Hale-Bopp observed by SOHO/SWAN on April 3, 1997. 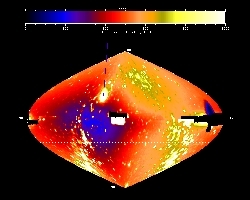 False color image of the sky (in ecliptic coordinates) in the 110-180 nm spectral range made by the SWAN instrument on-board SOHO on April 3, 1997. The SWAN instrument observes the solar UV light which is back scattered by neutral hydrogen in the interplanetary medium. Comet Hale-Bopp is clearly visible because of its huge hydrogen cloud produced by photo-dissociation of water vapor molecules evaporated from the solid nucleus. This nucleus is composed of ice and dust and its size is estimated to be about 40 km of diameter. In contrast, the size of the hydrogen cloud is more than 100 million kilometers, which makes it the largest object in the solar system. The analysis of the hydrogen cloud indicates that about 600 tons of ice are vaporized and ejected in space each second on this day. Credits: SOHO (SWAN consortium), ESA, NASA. SWAN: Service d'Aeronomie du CNRS (France), Finnish Meteorological Institute (Finland) SOHO is a project of international cooperation between ESA and NASA.